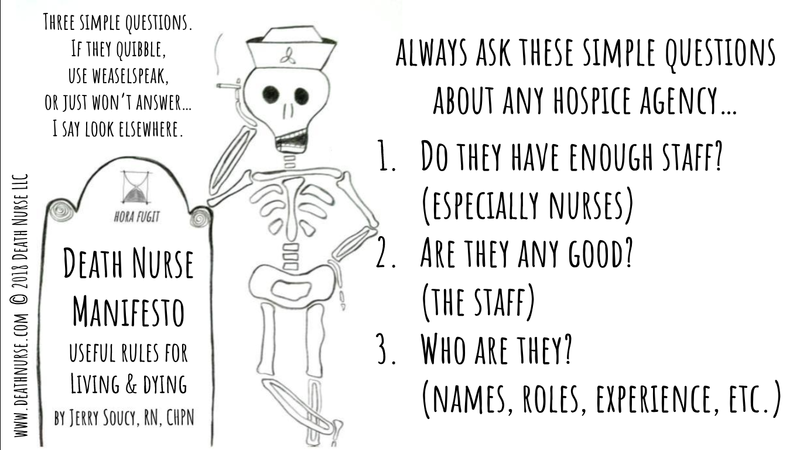 Please also read my earlier post on the 4 admonitions in Death Nurse Manifesto, since these 3 questions directly relate to the admonitions that hospice agencies be transparent and not abuse their staff. 1. Do they have enough staff? Every patient's and family's first need is for care that's safe. One of the best indicators of an agency that can provide safe care is safe staffing - having enough staff on hand and available to provide good care. What's the agency's average daily census (ADC)? It should be a simple number to obtain, and will generally range from less than 100 up to several hundred or more. If the agency operates in multiple offices, get the ADC for the office that will be responsible for your care. How many full time hospice RN case managers (RNCM) does the agency currently have on staff to care for that population? The RNCM is the most critical role in hospice, responsible for coordinating and supervising the hospice interdisciplinary group (IDG) that also includes health aides, social workers, chaplains, physicians, nurse practitioners, and others both inside and outside of the agency - like your longtime family physician, or your oncologist. It's a full-time Monday-Friday gig, and there's never a dull moment. Also ask if the RNCMs have other responsibilities, like covering evening or weekend on-call, and admitting patients and families. Additional duties undermine the purpose of the RNCM role. The given and calculated average RNCM case load can help us start to learn if they have enough staff. Beware of agencies that routinely overburden staff with high caseloads and/or require them to cover evenings, weekends,new admissions, etc. That's abuse. You need to also know the numbers and case loads for social workers, chaplains, and home health aides. But if an agency can't find or retain enough staff, it will most often show up first among the RNCMs. An abusive agency culture means abuse for everyone. 2. Are the staff any good? If you're satisfied that the agency seems to have an adequate quantity of staff, you next want to understand its quality. Of course an agency is going to say their staff is universally qualified, and may even mention certifications and awards, or point to a press release. Humans are biased about their own skills, and tend to overestimate what they know. They can also become defensive when confronted by a demand to, "Prove it!" You're not asking an individual about the quality of their work - you'll see it when you meet them. But you can get a sense of whether or not the agency is a place where people who do good work want to be by asking, "What's your annual turnover?" It's important to know the turnover in general, but it's even more important as it applies to clinical staff and location. For example, a 350-person agency that brags about 20% annual turnover is still talking about 1/5 of its staff - 70 people. They're not telling the full story, either. The agency operates two locations - one site houses 300 people, including administration and back office staff, while the other houses 50, all of whom are clinical. If 35 of the 70 people who left in one year worked out of the small office, and were clinicians, their effective turnover rate is 70% (35 out of 50). I'd want to know why, though simply knowing turnover was so high might be enough. You may get a blank stare in response to your question about staff turnover. Or a hostile one. That's because the answer can be the clearest indication of an agency's negative practice environment, and the brightest red flag waving everyone away - clinicians, caregivers, and the community. Don't give up, but if they won't answer, that's your answer. You can also search employee reviews at websites like Glassdoor and Indeed. There may not be large numbers of them compared to that pizza joint down the street, but things like the details of negative reviews, and their timing, can provide some insight. If they won't talk about clinical staff turnover, I'd look for another agency. You could also ask about their use of temporary and contract clinical staff, often called 'travelers.' Bottom line: not a good idea in hospice. Please also see this 2018 post Hospice 101, Part 1 - Meet Your Nurse. 3. Who are the staff? Lately it seems corporate hospice sites are moving to a model with little information beyond stock photos of sunflowers, bland brochure weaselspeak, and an 800-number direct to sales. Both are stupid, wrong, awful, and unhelpful. 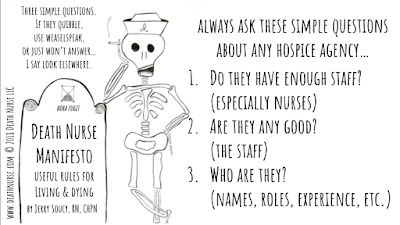 Every hospice agency needs to list their staff roster on their web site - names, credentials, and roles. Bonus points for photos and extra bonus points for bios and staff-generated content. The only reason for an agency to not list staff is the same reason for not talking about safe staffing and staff quality - because the answer is unfavorable to the agency. You'll meet staff when they visit. But it would be best to have some idea of who they are, and who they work for, before they walk through your door.